Then, you’ll need to visit your domain registrar, in this case iwantmyname, and perform the following steps. 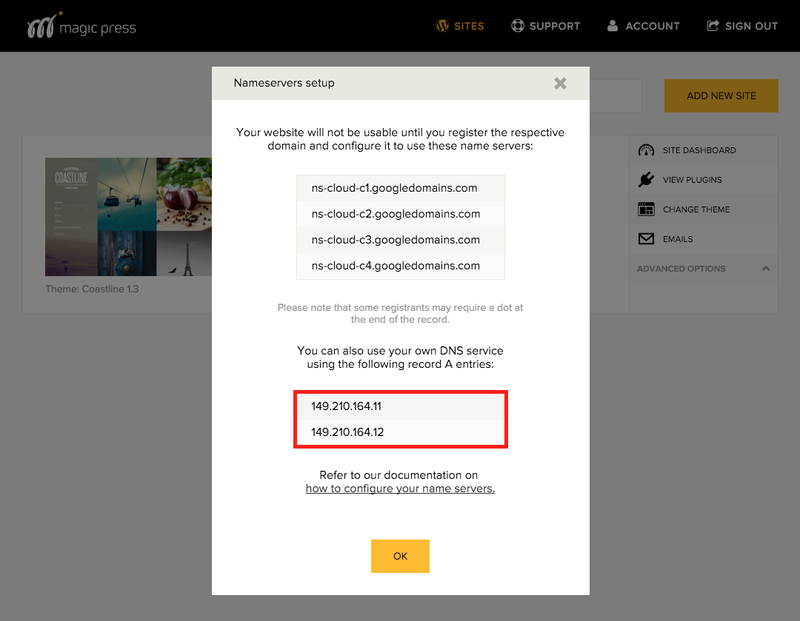 Login to your account at iwantmyname and select Manage DNS under Setup in the main navigation. On the next screen, select Update nameservers next to your desired domain. Click the drop-down menu and select I have my own nameservers… from the list. Fill out the name server fields with the name servers provided in the MagicPress panel shown above. Make sure any excess iwantmyname information is deleted from the respective fields. Mixing custom host nameservers with iwantmyname nameservers might produce odd results. Now that your nameservers are changed, click the Update nameservers button to complete the process. Please note that once your nameservers have been changed, all further DNS management will move to your hosting provider. You will not be able to make any changes to A, CNAME or MX records in your iwantmyname dashboard any longer. Login to your account at iwantmyname. Click Domains, then click DNS and select your domain. Leave the Hostname field empty. Choose A record in the Type drop-down menu. In the Value field, insert the IP address provided in the MagicPress panel shown above. Fill out the respective data in the TTL field. Click the Add button to add the record for your domain. Click Save DNS Settings to complete the process.